My love for disaster films runs deep, from The Poseidon Adventure to Deep Impact, Dante’s Peak to The Impossible. There’s something about watching it all go wrong, watching nature flippantly destroy everything we’ve created, and then watching as those who managed to survive try to rebuild. I guess it’s the human spirit element; stay alive no matter what, help those you can, understand that you’re not exactly in control. Granted, some disaster movies are completely awful, like Volcano, some are just bad, like San Andreas, but they can all be enjoyed in their own way, whether because they’re actually well-made or simply because it’s fun to mock. 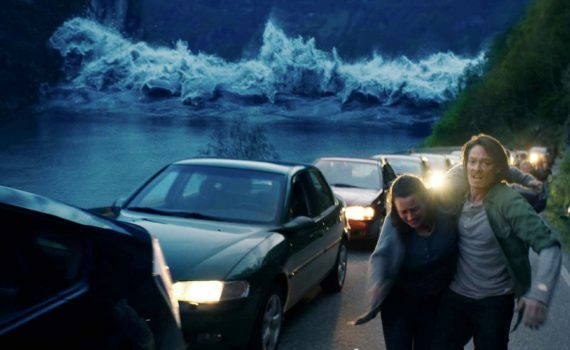 The Wave is Norwegian disaster, but it stills clings to very American norms, giving me most everything I want from the genre while also standing as a solid overall film. Geiranger, Norway faces an unusual danger. Located among the beautiful fjords & mountain waterways, its surrounding land is completely unstable, a constantly shifting mass of rock that is difficult to predict. A massive rock slide into the inlet would create a giant inland tsunami, which would have the potential to wash away the entire town, a booming tourist sight. Geologists watch over the mountains constantly, but it’s only a matter of when, not if, the disaster will occur. For lead scientist Kristian, a new job means that he & his family will move away from the idyllic village, leaving behind the rocks he loves to study. But a shift in the foundation on his very last day might be the indicator that he has feared for years, the sign that everyone was afraid but knew was coming. The Wave is mostly in the style of The Impossible, though it isn’t a true story. It sticks to the family element of the disaster genre, trying to reach your loved ones before they are all swept away. It stays away from the silly or even the bloody of a movie like Dante’s Peak, but still packs in plenty of disaster action. It’s impressive the way the wave is filmed, and the way the country around the inlet is destroyed, credit going to the cinematographer for his solid work. There were only one or two cheesy moments, otherwise the film flowed smoothly. Kristoffer Joner was a great choice, and if you ever get the chance to see him in King of Devil’s Island, take it; it’s an excellent film. I believed his love for his family, I believed the carnage of the wave, and I enjoyed this genre-pleaser very much.